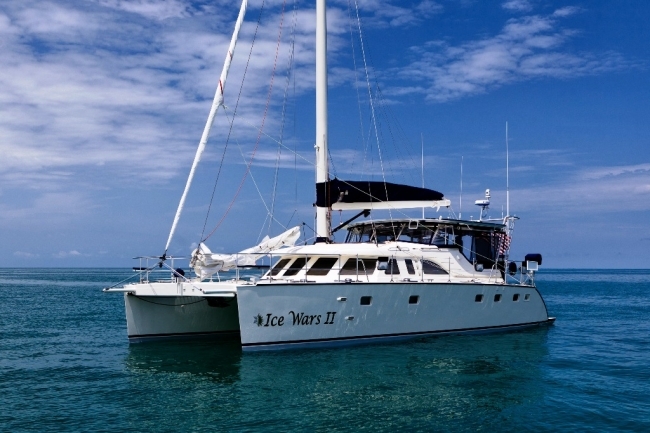 Ice Wars II offers 25% discount on Bahamas charters. Save $5,000! Price reduced to 2 pax/ $15,000 and 4 pax/ $16,000 and Captain only $12,950. This custom catamaran is ideal for shade-loving clients. Huge, enclosed aft deck is fully air-conditioned with 8ft headroom. The FastWater 52 was designed and developed to offer a completely outfitted, world class expedition cruising catamaran. Small enough to be manageable for a crew of two, but large enough to offer safety and comfort when sailing offshore, with enough interior space for full time live aboard. Ice Wars II benefits from the the strength of an aluminum hull and deck compared to conventional composite fiberglass construction, and in fact was made of a new alloy called Alustar™, which is 28% stronger than normal alloys. Acoustical and thermal insulation provides a very quiet boat with no interior condensation. Ice Wars II has a very upscale finish for the interior, with granite countertops, sycamore laminates and hard woods, colored acrylics, very attractive wenge wood and brass sole laminates, plush vinyl head and hull liners, and an adjustable custom wenge salon table with the Ice Wars II inlaid logo. The interior is truly stunning. The exterior deck layout has wide side decks for easy move­ment fore and aft, the cabin top incorporates generous overhang forward for shading of the forward salon windows. The foredeck includes large split trampoline and the bow rails have integral seats. Boarding ramp or ladder access is offered fore and aft, port and starboard. The air-conditioned cockpit is very large and roomy with two Stidd adjustable helm chairs and curved seating around a gorgeous custom cockpit table. It is air conditioned and completely enclosed with vinyl and acrylic. Each large transom swim platform houses a telescopic swim ladder for easy boarding. The interior fit and finish are a combination of composite granite tops, exotic wood veneer, pressure laminate and acrylic. The interior layout is designed for four guests with additional accommodation for two crew. All hanging lockers are cedar lined and all locker doors have blind latches for a clean appearance. Climate is controlled with three independent 16000 btu air conditioners with a built in dehumidification system. Dreamline waterfall faucets, and the heads are freshwater Techma - the owner’s head even has a hot and cold bidet! The starboard hull is dedicated to the owner's stateroom with queen size berth (with very comfortable Tempura mattress) and storage, large hanging locker, locker with shelves, head with a hot/cold water bidet and separate shower stall, and laundry/work room with work bench, washer/dryer and storage. The port hull offers an aft queen size berth (also with Tempura mattress) with storage, hanging locker, several pantry and storage lockers and a hot/cold water bidet. The crew cabin is forward, with bunk berths and hanging locker. The main salon, galley and navigation station are on the bridge deck. Salon amenities include L shaped settee with mast mounted table, recliner chair, hideaway TV system, a surround sound Fusion Stereo system with three zones that support sound enhancement throughout the Cat. The galley includes super insulated, top loading, 12v refrigeration and freezer compartments, four burner propane stove cook top, microwave/convection oven, dual sink, icemaker and trash compactor. There is abundant storage with slide out racks in all cabinets.